Oh my word! I am so in love with my My Glam bag this month! I just love everything. 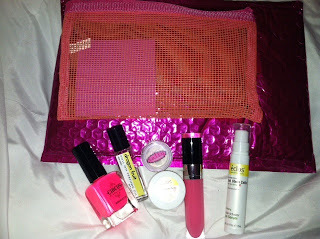 They send everything in a cute fuchsia padded envelope, so you can spot it right away. Every month, they also include an adorable cosmetic bag! I love these because I think they make a great way to give gifts! Everything came in a cute mesh orange with pink trim bag.Value: ??? I like that the bag is a mesh and is breathable. Their bags vary so much each month! Circus by Andrea's Choice Nail Polish. Still not available for sale. Estimated price: $5.00??? I absolutely LOVE the color and used the white from last month MANY times. VERY high quality polish. My Glam Glam Gloss. Full Sized lip gloss sent as an extra "Thank you." ??? Total value: $28.37 and that does not include the bag AND the lip gloss! This continues to be one of the best value for beauty subscription boxes. I love MyGlam! I get BirchBox and have subscribed to others in the past as well, and MyGlam has been the best for beauty subscription boxes! I am glad you got to review this as I have heard mixed reviews about this box. It sounds like a great value for the money. great review! Well, they did not send it for free. It is one of the monthly ones I subscribe to. It is a really, really good box. I know people had some issues with it a few months back, but my 2 months as a subscriber have been awesome! I cannot say the same for BirchBox . . . which STILL has not arrived.